How To Moisturize Scalp Without Making Hair Greasy Completely - GoodGuysBlog.com - New, Technology, Marketing, Health and So on. The body moisturizes the scalp by creating an oil called sebum typically. If your body does not make enough sebum, the scalp could get dry due to the weather condition or styling. Other outside conditions could cause the scalps are dandruff and psoriasis. Moisturizing your skin is an easy task to accomplish as you need to buy and apply moisturizing products for your skin only. Nonetheless, moisturizing your scalp is a bit more complicated, especially if you have lots of hair. 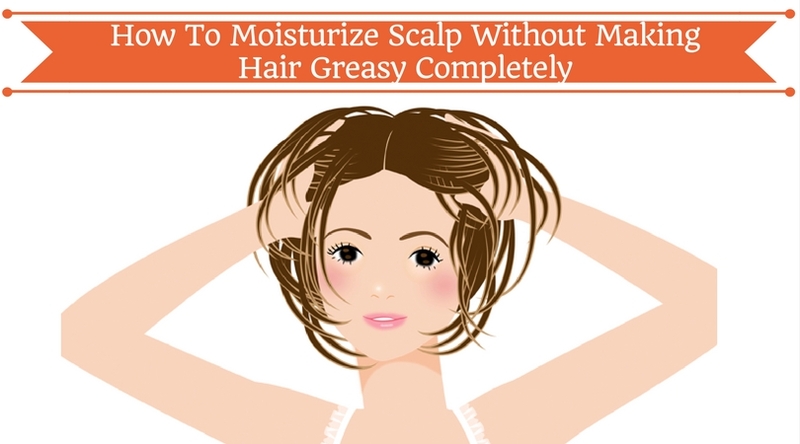 Here are a few tips on how to moisturize scalp without making hair greasy. It is truly uncomfortable to get the dry scalp, and you are frightened how to moisturize scalp without making hair greasy. Do not worry because you are not the only one in this track as many people often get the same issue like you. So, I have addressed some ideas to treat this awful frequency right away as I have used to get this irritation. Before moisturizing the scalp, you should remove the product accumulation by using a purifying shampoo. Furthermore, you are able to add a spoon of baking soda to your regular shampoo to increase the best result. Use a deep conditioner is an absolute task you should undertake, but you could not do it every day to evade the greasy hair. Thus, you use the conditioner once or twice a week only and do not forget to follow the producer’s instructions. On the flip side, you need to focus on some ingredients in a conditioning product that blocking the natural moisture in your scalp like the silicone. After finishing your cleaning hair process, you could use some natural oil products for the scalp. Massage a natural oil such as coconut oil, olive oil, jojoba seed oil, carrot seed oil on your hair about one or more spoons relying on the length, the dryness and the thickness of your hair. Please keep in mind that you should not choose the cleaning products that contain the petroleum substances like Vaseline as these elements could make your scalp drier and block pores. Put a little water into your scalp is another great solution that you ought to try as water is lightweight and a foundation moisturizer. You enable to drop a little amount of olive oil in a water spray bottle to accelerate the moisture level. Massage your scalp is also an essential task for your scalp resembles you brush your teeth daily. So, you just need to massage your scalp for a few seconds to arouse the natural oil production. By doing that, your scalp makes natural oil, and sweeping your hair could also increase and circulate oil. Milk-hair conditioners are an ideal product to boost your moisturizing scalp without making hair greasy. Because these products contain a lot of moisturizing substances with lots of essential vitamins and protein content. These properties are nice bounces to make your glossiness hair more and more. Milk also has other minerals could handle overindulgent oil on your scalp and your hair as well. Using the milk cream product is not a bad idea as this approach is also used for hair moisturize. However, milk cream will boost its effective utilization when you make it as the hair masks and packs. Once you apply this solution, you might control the amount of moisturizing on your hair with milk. For those who are allergic cow milk, you could change the coconut milk as a replacement product to continue the process. In case your time is limited, you ought to buy the hair lotions on the market, and you should read the labeled instructions carefully before using. As there are plenty of kinds of hair creams and lotions, you also should read and select the right product for your scalp. Take an amount of the product and massage around your scalp and wait for two minutes and wipe them out. Silicone-free and paraben are the greatest substances in the hair lotions because they are safe for all of the scalps and hair. As your body could produce a natural substance that it is called sebum, commonly known as a kind of oil to make your skin as well as your hair smoothly and softly. Additionally, sebum could protect them from several negative properties. However, please bear in mind that your scalp and your hair need to absorb the sebum in a limited amount only. Therefore, if your body produces too much sebum, this can cause some side effects such as greasy hair, pimples, and oily skin. Once you have recognized how to moisturize scalp without making hair greasy, you also need to know the causes of greasy hair to get the best consequence in this frequency. For those who have a member of their family has oily skin, you will get the similar issue about the sebum. Exerting the product that has artificial detergents is able to remove the natural oils from your scalp and hair. Then, your body must work harder to make a different change by producing sebum. Hormones play a key function of producing the sebum. When the hormones level increase, sebum definitely accelerates which cause the oily skin, greasy hair and other issues. Thus, handling and carrying on equitable hormones level is a crucial part to stabilize an amount of sebum. You wash your hair daily or you do not wash them over one week will lead to the greasy hair. In fact, dirty scalps could be easily greasy, and washing your hair daily might happen the imbalance hormones level. So, you should use this routine task twice or three times per week only to get the proper balance. How to moisturize scalp without making hair greasy is not a new question, but it is still a complicated wonder for everyone to tackle this issue. If you try and apply those solutions but they do not work well on your scalp, then it is the time to contact a doctor to find out the exact reason. Eczema, psoriasis or seborrheic dermatitis could lead to dry scalp and dandruff.